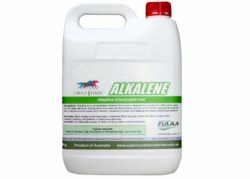 Alkalene is a pH neutralising liquid gel designed to aid the buffering process to return the pH of blood and body fluids to normal levels and prevent acidosis, dehydration and tying up. Why is Acid Balance Important? An Acid is any substance capable of donating H+ (protons) while a base is anything that will accept a proton. These work together to tightly regulate blood acidity, however, high concentrations of H+ disrupts that balance leaving the H+ to bind undesirably with proteins and enzymes impairing there activity. H+ overload is largely due to diet, horses have only a limited ability to digest starches in the stomach and intestines and so too much starch will cause it to be carried to the hind gut were it disrupts Volatile fatty acid production, which are used by the horse for energy, and instead the starch is fermented leading to an increased production of lactic acid and thus a rise in H+ levels and a drop in pH. This pH drop leads to the death of gut microflora and the production of microbial toxins conditions which can lead to laminitis and colic as well as a reduction in appetite and B-Vitamin Deficiency. Buffers what do they do? Buffers such as phosphate are weak acids or bases capable of taking up (binding) or releasing H+ thus minimizing pH change.